The battle over Neil Gorsuch’s nomination to the Supreme Court will likely hinge on the votes of 10 Democratic senators who face re-election next year in states President Donald Trump won in November. That is setting off a furious battle between liberal and conservative groups for the votes of senators, including Heidi Heitkamp of North Dakota and Joe Donnelly of Indiana. 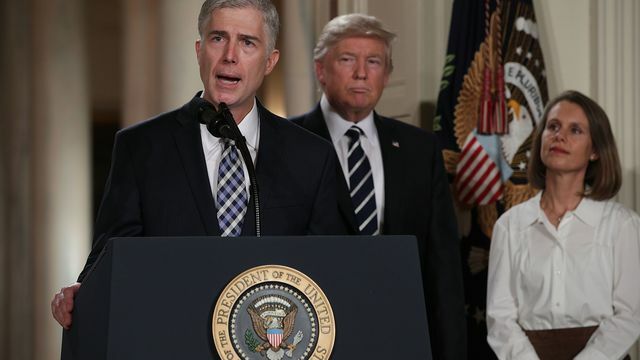 Liberals plan an all-out campaign to argue that working-class voters will lose with Gorsuch on the court, while the conservative Judicial Action Network is running a $10 million ad campaign geared toward persuading those Democrats to back him, or at least allow a final Senate vote. Senate Democratic leaders face intense pressure from their energized party base to oppose Trump’s nominees, particularly for the high court. They also want to protect the 10 members in Republican-leaning states, even though they have little chance of taking Senate control in 2018. Republicans hold a slim 52-48 majority but have only two incumbents — Jeff Flake of Arizona and Dean Heller of Nevada — in competitive races next year. Senate rules require 60 votes to advance a Supreme Court nomination. While Trump publicly urged Majority Leader Mitch McConnell to “go nuclear” and end filibusters if Democrats try to block Gorsuch, the administration’s strategy has shifted to seeking the 60 votes needed to end a filibuster, said Leonard Leo, executive vice president of the conservative Federalist Society. He’s on leave to advise the White House on the confirmation. Gorsuch, 49, nominated to replace the late Justice Antonin Scalia, is meeting individually with senators this week to seek their support. Two of the Trump-state Democrats, Joe Manchin of West Virginia and Jon Tester of Montana, have already met with Gorsuch and say they’re swayable. “I have not made a decision yet on that, but I am open,” Tester said. He said he and Gorsuch discussed issues related to the Clean Water Act, abortion and campaign finance. Dakotas under blizzard warnings as winter storm forecast over central U.S.